First, we consider the SSO-SDS pair. Over the entire sample period, while the SPDR S&P 500 (SPY) advances by 7.9%, SSO (2X) and SDS (-2X) both undershoot their leverage targets by declining 30.3% and 61.2%, respectively. 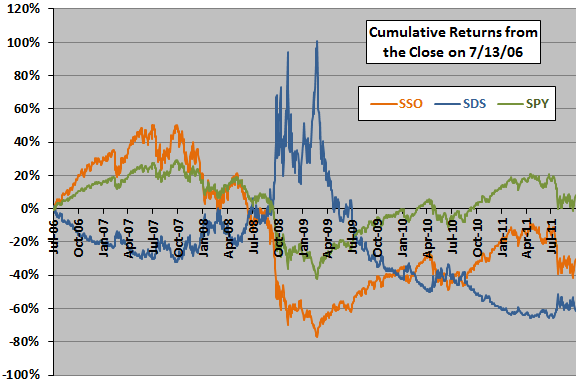 The following chart compares the evolutions of cumulative returns for SSO, SDS and SPYover the sample period. How does shorting equal dollar amounts of both ETFs at the outset perform? 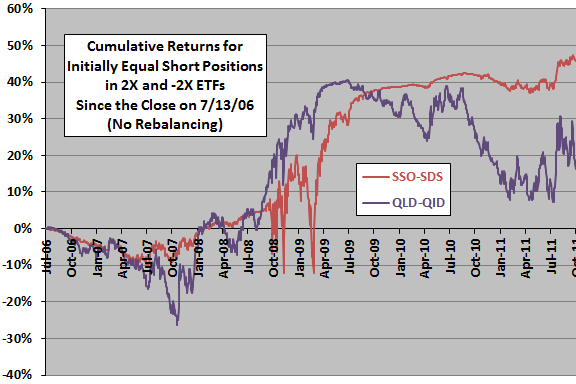 The next chart shows the evolutions of cumulative returns for equal initial short positions in SSO and SDS, and for comparison in QLD and QID, established at the close on 7/13/06 and held through 10/13/11. We assume that: (1) there is no rebalancing of the paired short positions; and, (2) the returns on the initial proceeds from the short sales cancel the costs of maintaining the short positions. The cumulative returns are mostly negative during the initial quarter of the sample period and mostly positive thereafter, with occastional surges/high volatility. The terminal values of initial $20,000 positions on 7/13/06 ($10,000 in each of the 2X and -2X members of both pairs) is $29,145 for SSO-SDS and $23,283 for QLD-QID. Under what conditions does shorting of a leveraged ETF pair work best? Is volatility of the underlying, as an indicator of level of difficulty in rebalancing the ETFs to targeted leverages, key? 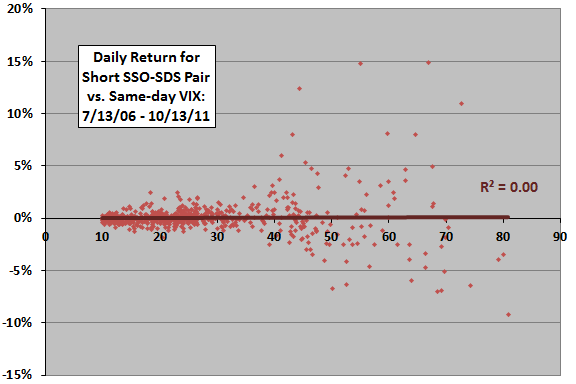 The following scatter plot relates the net daily return for the shorted SSO-SDS pair to same-day S&P 500 Volatility Index (VIX) over the entire sample period. The Pearson correlation for these two series is 0.00, and the R-squared statistic is therefore also 0.00, indicating no relationship. The comparable scatter of net daily return for the shorted QLD-QID pair versus same-day NASDAQ Volatility Index (VXN) also has an R-squared of 0.00 and is much more dispersed vertically for low values of volatility. In case there are material non-linearities in the relationships, we try rankings. 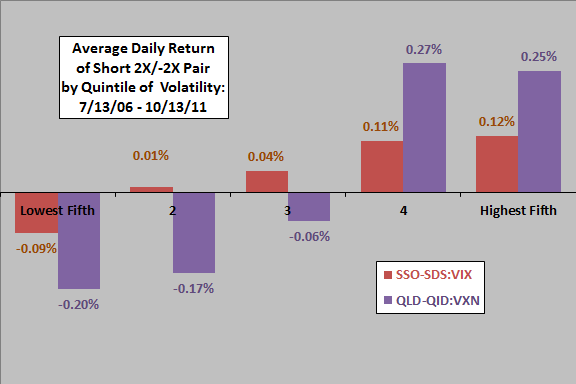 The final chart shows the average net daily return for the shorted SSO-SDS pair by quintile of same-day VIX (SSO-SDS:VIX), and the average net daily return for the shorted QLD-QID pair by quintile of same-day VXN (QLD-QID:VXN), over the entire sample period. Results suggest that the shorted pair tends to produce positive (negative) returns when volatility is relatively high (low). In summary, shorting pairs of 2X and -2X leveraged ETFs may pay off over long periods as rebalancing effects grind on fund values. Different pairs may behave differently. As noted, the above analyses do not employ periodic rebalancing of the leveraged pairs. Such rebalancing may materially affect outcomes. As noted, the above analyses assume zero net cost of shorting. Any net costs would reduce reported returns.